On Tuesday 25th and Wednesday 26th November we are looking forward to returning to Brussels for the IBC Advanced EU Competition Law. The conference will see some of the leading competition lawyers, regulators, competition authorities, economists, legal advisors, and academics come together to discuss cartels, private enforcement, vertical restraints, state aid, mergers, and more. To find out what you can expect from the conference, watch the video highlights from last year, including a clip of our very own Francesca Halstead. One of the key discussion topics this year focuses on cartels. We have been doing our homework and have prepared this infographic which examines legislative updates from the UK and key cases from around the EU, from the Finnish Asphalt Cartel to the Romanian Construction Cartel, and many more in-between. It also shows a step-by-step summary of the Settlement Process, and summarises the Leniency Notice. Content has been taken from Oxford Competition Law and made free to access so that you can prepare and be up-to-date ahead of the conference. 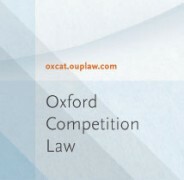 Oxford Competition Law is the only fully integrated service to combine world-renowned market-leading commentaries with rigorous, selective National case reports and analysis from EU member states. Please do stop by our stand to find out more about our latest publishing, and claim your free trial to Oxford Competition Law. If you would like to view this infographic as an interactive PDF, please click here to discover more about Competition Law. Headline image credit: Justice Painting, by Hans. Public domain via Pixabay. Rachel Fenwick is an Associate Marketing Manager at Oxford University Press. Simon Jared is a Marketing Executive at Oxford University Press.